The PhD Social & Support Network is organised and run by fellow PGRs at different stages of their PhD journey. The network was set up in 2014 by two PhD students due to a dearth in non-academic support for PGRs. 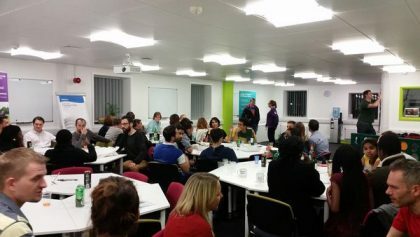 It was recognised that PGRs tended to only meet others in their own department or on Graduate School led training courses and so the social and support opportunities to meet others from across the University were limited. The network aims to be inclusive of all PGRs whether they are based in the office or at home. It provides a means to gain support from others who are undergoing the same process as well as offering a social space where individuals can spend time together away from their research. We are passionate about supporting PGRs through the multitude of non-academic issues, which may be faced during the PhD journey. Although we are not a counselling service, we are able to provide a supportive atmosphere to help PGRs feel welcome and signpost to the correct support service where appropriate. We welcome new committee members who are as passionate about supporting PGRs as we are! If you would like to join us, please complete and return the expression of interest form.